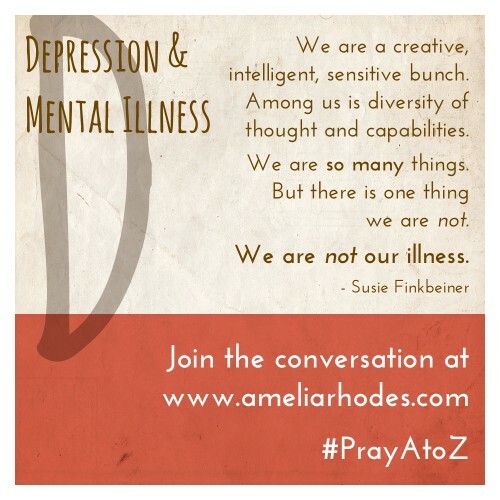 Today, we continue our series Pray A to Z, and D is for Depression & Mental Illness. If you’ve missed a few posts, you can get caught up on the series here. If you don’t have your printable prayer cards yet, you may download them for free, here. Many people face their mental health struggles silently and alone for fear of being judged or misunderstood, especially in Christian circles. Today, author Susie Finkbeiner bravely shares her story with us and offers encouragement that we are not alone. It starts as a dull to my shine, depression does. Inch by inch it tip toes up to me, taking over my emotions all of the sudden. The dull sinks into breathlessness. It steals my energy to do the smallest of things. Breathlessness gives way to thoughts of worthlessness. “Think positive thoughts,” some say. But the only thoughts in my brain are of my failings, the ways I hurt people I love, fear that I’ll never be okay again. Always the fear that, this time, the depression won’t lift. That “mentally ill” will be a name-tag smacked onto my chest. Depression has been a life-long, on and off struggle for me. When I was a kid, I remember the feelings of it tangling around me and fearing that it was because I didn’t love God enough. The depression bred fear and the fear fed the depression. Then, as gradually as it attacked, it would recede. The sun seemed brighter, joy returned, my fears eased. Always, though, there was the threat that it could return at any time. It wasn’t until late into my college career that I put a name to it. I confessed to a friend that I battled depression. The friend, I believe, was well intentioned, but didn’t understand. She asked me why I couldn’t just choose joy. She prayed with me and gave me a hug, expecting my depression to simply lift instantly. In that moment, I realized that depression, like most other mental health issues, is misunderstood, particularly among faith communities. According to the National Alliance of Mental Illness, one if four adults suffer from some type of mental illness (depression, anxiety disorder, etc.) in the United States. One in seventeen are diagnosed with profound mental illness (such as schizophrenia). 61.5 million Americans have some form of mental illness. It’s a huge number, isn’t it? When I see a number that large, I feel numb to it. But when I put a face to the illness, I am able to see it for what it is. A human condition. Think of it this way, those with mental illness are brothers, neighbors, coworkers, mothers, classmates, best friends. They are raising families and working long hours. They love and are loved. Some of them live in homes to receive the support they need, others function fine. Some are alone and others are treated poorly. Those diagnosed with mental illness exist on a spectrum of lifestyles and beliefs. We are a creative, intelligent, sensitive bunch. Among us is diversity of thought and capabilities. We are so many things. But there is one thing we are not. We are not our illness. Each person who struggles with depression or anxiety or schizophrenia has a name. Those who live with an eating disorder or neurosis or addictions have identities outside of their illness. We are not our illness, but there is something we are. We are made in the image of Creator God. We are precious children of the Heavenly Father. He sees us, all of us, as we truly are, beyond the illness. Beyond the confusion and pain and helplessness. He sees us and loves us. Because of His love, we are not alone. Susie Finkbeiner is a novelist from West Michigan. Her novels PAINT CHIPS and MY MOTHER’S CHAMOMILE are both available from WhiteFire Publishing. Her third novel CUP OF DUST will release with Kregel Publications at a soon to be determined date. Pull out your D card (download prayer cards here if you haven’t already). Write down names of those you know who are struggling with depression, anxiety, and other forms of mental illness. Pray they will not feel isolated and alone. Pray for greater understanding of this illness and a supportive community. Pray for eyes to see those around you who might be silently struggling. Ask God to show you how you might encourage and uplift those who are battling mental illness today. Pray that Christian communities will be safe places for people to share their mental health struggles. How can we #pray for those facing #depression? #PrayAtoZ with us. As we #PrayAtoZ D is for Depression. Oh I understand the struggle with depression so well and the well intended advice of those who don’t understand. Thank you for sharing this part of yourself with such vulnerability and honesty. God willing , one day, depression will not be so misunderstood. Such a huge number, I pray the church community can continue to grow in meeting those who suffer in the right space. I think when we share our stories, hopefully others will have the same courage. Thank you for sharing your story. Yes! This is something the church can explore. Some do a good job, others…well…not as much. Thank you for the encouragement, Lisa! 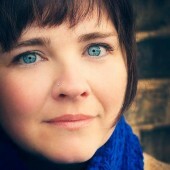 Yes, Lisa – may the church continue to grow to be a safe place for those who suffer these diseases! There is such great value in sharing our stories! Alas, we have been released from the closet! I have dealt with depression and anxiety all my life, and also didn’t recognize the condition for what it was until I was in college and drowning amidst the masses. Certainly not an issue to be discussed in those days back in the ’60s, but that didn’t change the fact that I was at the bottom of a pit, and struggling to find my way out. The condition is hereditary, and has reared its ugly head in numerous members of the family. Praise God help has become available to those of us who desperately NEED help. I think that we all tend to hide behind something in order to fall into mainstream society, but my answer has been isolation much of the time. I can fool a lot of people a lot of the time, but I only step out when I absolutely force myself. Susie, I nearly didn’t show up for the Baker Book House author signing or the Friday night Breathe conference activities. It would have been so easy to just stay home. I’m so glad that I pushed myself out the door and had the opportunity to meet some wonderful people who have each been through some pretty difficult times in their lives too. Bless your heart for opening up and sharing your battle with this ugly demon so that others will feel free to come out and share with you! Nancee – I’m so glad you made it to the event at Baker and Breathe! We’ve come so far as a society in understanding these illnesses, yet I’m sure we have so far to go. I heard a counselor share recently about how they can be hereditary. It was encouraging to hear all she shared, and not have it written off as just a spiritual thing that we need to have more faith for. Oh, Nancee, I wish I could just hug you right now. It is so difficult to live with this, but it helps us to have strong empathy and compassion (at least I think so). I’m glad you came Thursday and Friday. Your beautiful smile warms a room. Susie, you’re so right about empathetic and compassionate friends who can relate and understand the issues we face. If my smile warms a room then yours make it sizzle! You’re a sweetheart! Thank you for this, Susie and Amelia. My first husband suffers from clinical depression and two of my sons struggle with anxiety and depression. It has taken me years to understand and to learn how to walk with them through this. Thank you for your transparency, Susie. I praise God that we are all made in His image, which is perfection. Bless you both! Ingrid, my heart goes out to you. I do understand supporting a close family member through difficult times. It is exhausting. But loving them make such a difference. Bless you. Ingrid, Thank you for sharing a piece of your story with us too. I think this is a never-ending process of learning how to understand and walk with people as they go through us. It can be a lonely journey. Bless you for working so hard to walk with them and not give up! Robyn, Thank you for being transparent with us too. I’m go thankful to hear that you were able to get help and are continuing down the path to feeling well. I’ll be praying for you (on my D card!). It was so nice to see you last weekend! Many hugs, Robyn. It took me awhile to find the strategies that worked for me…and I’m still learning. I’m glad you feel some peace. I have suffered from postpartum depression with all three of my children, but it really hit me with the third one. There were situations going on in my life that made it impossible for me to climb out on my own. I finally decided to get medicated – and I am so glad that I did. I really wish I had with my other two. So many people told me that it was just the “baby blues” and that I should “snap out of it” and “look at my cute baby” to feel happy. I feel that we are starting to get a grasp of depression as a society, but PPD is still so very misunderstood. In my opinion, the best thing you can do or say to someone battling depression of ANY form, is to just remind them that you are there for them. That you love them and care about them very much. Give them a hug, let them cry on your shoulder, listen to them. No judgements, no advice. Being there and listening – REALLY listening – is the best thing you can do. Susan I am sorry for the struggle with PPD you had. I agree, it’s stigmatized unduly. I experienced deep anxiety and downright fear after my daughter was born. I didn’t know how to name it or what to do. It was horrible. I’m thankful that medicine worked for you. What a relief, I bet. YES! We need to know that we’re loved no matter what. I remember my husband holding me and telling me that he loves me no matter what. It meant the world to me. We need to remember to do that for others too. Thank you for sharing your story, Susan. You are not alone.